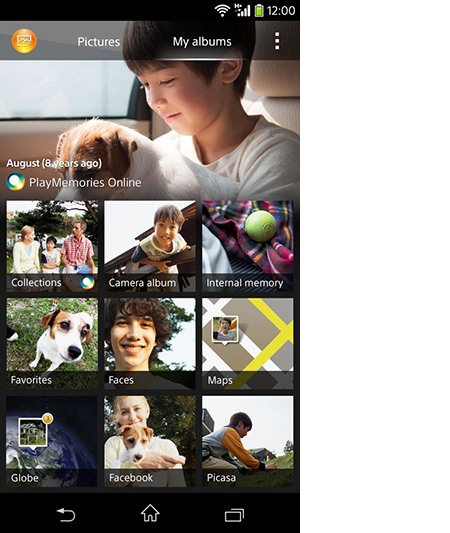 Explains how to use the feature to enjoy PlayMemories Online in "Album". View all photos and videos. Set up and edit pictures. The menu items change depending on the screen currently shown. - If you select - [PlayMemories settings] and turn on［All Sync], your photos will be automatically uploaded to "PlayMemories Online" when they are taken. This allows you to view the photos on other devices. Tap the album icon or swipe the left end of screen to show the menu. - If you have not signed in "PlayMemories Online", you can sign in by tapping [PlayMemories Online] from the menu. Tap here to enjoy watching photos in PlayMemories Online. 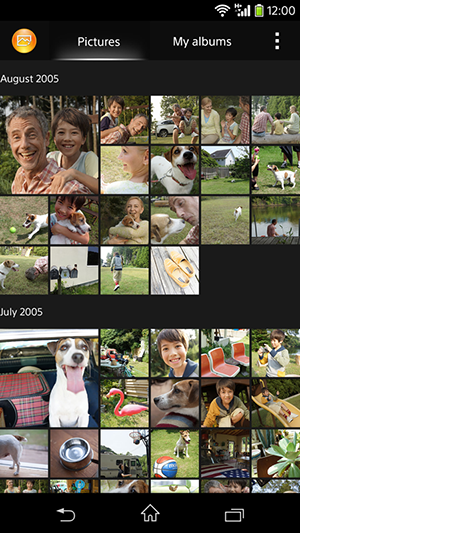 Library: List the photos uploaded to PlayMemories Online. You can collect your favorite photos to create the collection. If you have already created the collection, it will be displayed under [Library]. This is also where [Friends Collection] shared by your friends are displayed.